In this area of the Apparel Search fashion brand directory, you will find children's fashion brands from leading apparel companies and fashion designers. On this particular page, you will find information regarding children's clothing with the Looney Tunes brand. You are welcome to utilize this section of our clothing guide to review Looney Tunes news, Looney Tunes blog posts, Looney Tunes photos, and more. Please understand that you may run into a few photos or a tad of information that does not actually pertain to the children's Looney Tunes fashion brand. Unfortunately, no search technology is absolutely perfect... We will continue to do our best to bring you as much information about the children's Looney Tunes fashion collection as possible. Shop for products with officially licensed images & designs of Looney Tunes characters on clothing, shoes, and fashion accessories for children. Looney Tunes is a show that reruns classic cartoons featuring Bugs Bunny, Daffy Duck, Tweety, Sylvester, Pepe le Pew, Road Runner, Wile E. Coyote, Foghorn Leghorn and more. These classic characters were featured in 1000+ theatrical cartoons and many prime-time specials made for TV as well as numerous classic cartoon excerpts. Looney Tunes was originally aimed at an adult audience when it aired for the first time in 1955, but unfortunately it was censored. It eventually became a show for children known as The Bugs Bunny Show in 1960, which aired on ABC. Looney Tunes made it's way to Nickelodeon along with numerous Warner Bros. classic cartoons including some of their oldest black-and-whites and almost their complete canon of '60s cartoons. This show started in 1988 and ended in 1999. Now, the Boomerang block on Cartoon Network is the only place in the US where you can still see these timeless classic characters and their animated antics. 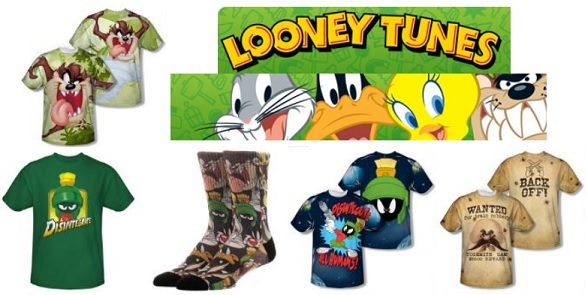 Learn more about Looney Tunes clothing for kids. Visit the Warner Bros. website. If you have changed your mind and do not wish to research the brand Looney Tunes, you can use the search engine on this page to find another clothing label that may be of more interest. Apparel Search is a leading guide to fashion, style, clothing, glam and all things relevant to apparel. We hope that you find this Looney Tunes page to be helpful.